On Sunday 31 May 2009, I was pleased to attend a service of thanksgiving at St. Paul’s Church, Bedford, for former members of the Women’s Land Army and Women’s Timber Corps, arranged by the Lord Lieutenant of Bedfordshire, Sam Whitbread. Over 300 people attended, including over 70 former ‘land girls’. This was followed by a lively reception at the Harpur Suite. The sun shone and everyone was in their ‘Sunday best’ clothes. The service, arranged by the Reverend Canon John Pedlar and Mr. Whitbread, included both familiar hymns – “All people that on earth do dwell”, “We plough the fields and scatter”, “All things bright and beautiful” - and a choral version of The Land Army Song, “Back to the land”, for female voices. As the historian of the Women’s Land Army (WLA) in the county I was able to contribute by suggesting the secular readings – an extract from ‘Land at War’ by Laurie Lee and a moving poem, ‘Remember us’, by Hilda Gibson. I read the Laurie Lee passage which celebrates the contribution that ‘land girls’ made to wartime agriculture, enabling the nation to be fed. The poem was read by Faith Baxter, daughter of Mrs Erica Graham, who chaired the WLA county committee during the war. One of the highlights of the service was a live ‘conversation’ between Pam Rhodes (of BBC’s ‘Songs of Praise’ fame) and three representative former ‘land girls’ I had chosen to give their own personal testimonies of service on the land during the Second World War. This brought alive some of hardship and laughter which these young women experienced and must have triggered many memories in the minds of those other, now elderly, ladies (some of them in wheelchairs; others quite sprightly) in the congregation. It was fitting that this final great ‘get-together’ should come in the year after these former ‘land girls’ – who had given up the comforts of home to volunteer to take the place of male farm workers drawn into the armed forces for the duration of the war – were finally awarded a Veterans Badge to acknowledge their sacrifice and contribution to the war effort. Mr Whitbread talking to forrmer Land Girl, Liz Day (photo by Ros Wong). 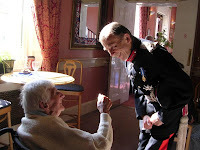 More photographs of the event are on flickr via the Lord Lieutenant's website.